At least 20 student leaders from four schools in Cagayan de Oro (CDO) are stepping up to promote disaster resilience to their fellow children. CDO is one of the flood-prone areas, located along the north central coast of Mindanao. “I used to think that disaster preparedness is all about emergency drills. In the past weeks, I learned that there is more to it and that I can be involved,” shares 18-year old Jessie from Camaman-an National High School. Maximising both traditional and non-traditional media, he and other student leaders produced information materials, including context-based posters, jingles, radio spots, drama, infographics, video presentations and more. “It does not end here. We plan to maximise these information materials to promote disaster resilience to our fellow students. We were consulted and involved in the production of these materials which I think was right because we know what children our age want, what gets our attention and what makes us stop to read and listen to something that seems boring at first,” Shaina, 16, smiles. She is the Supreme Student Government President in her high school. In a focused group discussion conducted by World Vision in Cagayan de Oro, majority of the students said that they know little about disaster risk reduction. They know about the concept of disaster preparedness but the knowledge is confined to that of emergency drills. While they said that there are several posters posted within school premises, these are not engaging enough to make them read the materials. In a separate discussion with school DRR focal persons, the teachers confirmed that their means of relaying DRR-related information to students are limited to emergency drills, posters provided by the district, and to the use of school bulletins. They also expressed the need for capacity building in informing and engaging their students on disaster preparedness initiatives. The United Nations Convention on the Rights of the Child (UNCRC) is an internationally ratified human rights treaty that highlights both the right of a child to be informed and to participate in matters affecting his or her welfare. In the Philippines, Children’s Emergency Relief and Protection Act (RA 10821) also punctuates the responsibility of the government to increase children’s participation in DRR. With these premises, World Vision, in partnership with the Communicating with Disaster-affected Communities (CDAC) – Disasters and Emergency Preparedness Programme (DEPP), launched the Championing Children in Communicating with Communities project. “The project recognizes that information is aid. Either before, during or after a disaster, the right information at the right time can help save lives. And children, young as they are, have the potential to become effective DRR communicators,” shares Arnold Salvador, CDAC-DEPP Project Manager. During the series of workshops, student leaders, together with their school’s focal persons, were oriented on the different laws that support the initiative. Results of the information needs assessment were also shared with them and were used as basis in contextualising their communication materials. “We already had an idea how to write jingles, slogans and drama but this time, we were taught how to create messaging that is both informative and engaging. We were taught how to package our works by introducing us to different software. It was fun and exciting and challenging all at the same time,” exclaims JC, 14, from Angeles Sisters National High School. Aside from training children and teachers on how to produce materials, they also went through a short simulation that focuses on how they can maximise photos, videos and the social media, especially during and after disasters. The concept of unified hashtag during emergencies was introduced. With the goal of raising funds for children in mind, Norman Garcia set his sight on the finish line. Child-focused aid organization World Vision begins its relief operation to displaced families affected by the ongoing brunt of Mayon Volcano. To cap off the year with another milestone, singer-actor Inigo Pascual joined international child-focused organization World Vision as its newest ambassador for children. 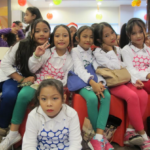 ING Bank Manila and World Vision celebrates Christmas with close to one hundred fifty students of the ING Learning Center.